Almonry Barn is a breathtaking slice of history on the Somerset levels. It sits proud opposite the medieval ruin of Muchelney Abbey. It once formed a part of the 800-year-old Abbey, and now nestles in its own peaceful orchard. The wide expanse of sky and countryside stretches for miles in every direction. Birdsong fills the air. The Almonry is the oldest barn of its kind in the country, yet Louise and her family maintain it immaculately. They have carefully styled the interiors at Almonry Barn to reflect a chic, designer aesthetic. In the bar, lounge and ceremony rooms you will find a classic British style with modern accents has been sensitively curated. Warm neutrals define the look. The atmosphere inside the Barn is quite astonishing. This place needs little to enhance it’s beauty, since the palette of its stones truly sings. The signature canopy of lights hangs perfectly in this warm and beautiful palette of blush, grey-blue and gold. Windows are juxtaposed at fascinating heights, and two sets of imposing barn doors are thrown open to flood the space with light. And if vaulted beams are your thing, then you’re in for a treat at the Almonry. In the orchard a handmade swing hangs opposite the duck egg shepherd’s hut. Chic white bistro furniture looks right at home on the terrace. It’s a rural idyll. Far from your typical barn venue, Almonry Barn is imposing and elegant with just a touch of rustic. Reminiscent of a French gite or Tuscan farmhouse, it’s the perfect luxurious venue with a continental, country feel. View a stylish barn wedding here. 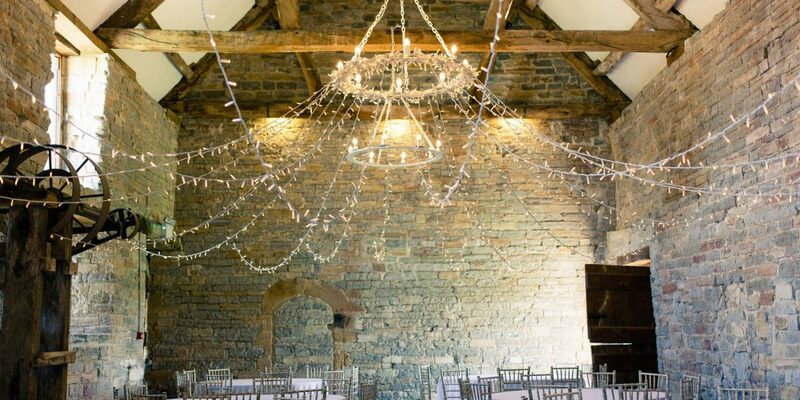 I would love to hear about your plans for a wedding at Almonry Barn. You can also get my guide to planning your own fine art wedding sent to you completely free – when you request your no-obligation, personalised quote.